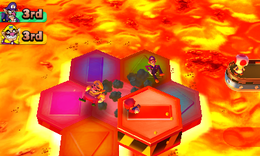 Hexagon Heat is a 4-player minigame found in Mario Party 2. Its gameplay is identical to the minigame Mushroom Mix-Up from the first Mario Party. The minigame reappears in the minigame compilation title, Mario Party: The Top 100. 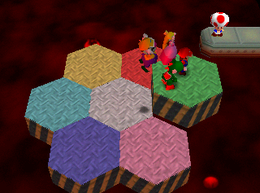 The players stand on the white hexagon in the center of a pit of magma. The other six then show up and join around it, and the minigame begins. When Toad raises a colored flag, all the players must go to the hexagon tile with the same color; all the other hexagon tiles slowly sink into to the hot lava. Players can also jump on their opponents to slow them down, or Ground Pound them to squish them flat and stop them altogether, at the risk of being eliminated themselves. As the game progresses, the hexagons fall and rise faster. The last player standing wins. The hexagons' order is always, from top left to bottom right: yellow, red, light blue, white (where the players start), green, dark blue, and pink. In Mario Party: The Top 100, the colors and order of the colors of the hexagons have been changed, and in addition, there are shapes imprinted on them, most likely to assist those with colorblindness. The hexagons' order in this game is, from top left to bottom right: dark blue vertical rectangle, green triangle, purple square, pink circle (where the players start), light blue diamond, yellow upside down triangle, and red horizontal rectangle. Additionally, players no longer recoil from ground-pounding other players. Game Rules – "Run to the hexagon that matches the color of the flag I [Toad] raise. Last one standing wins!" Advice – "The more time it takes to determine a winner, the faster the hexagons move. Stay on your toes!" Description – "Move to the same colored panel as shown on Toad's sign! Last one left wins!" On-screen – "Step on the same color panel as shown on the sign!" This page was last edited on October 12, 2018, at 22:49.